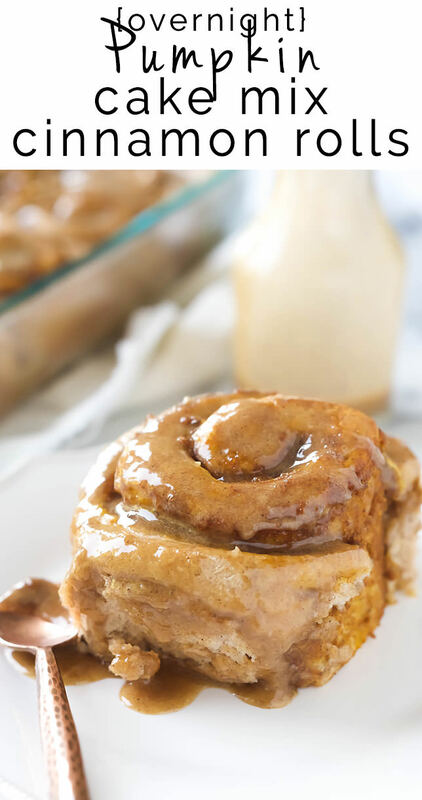 These Pumpkin Cake Mix Cinnamon Rolls are made easier by starting with a cake mix then drizzled in a delicious brown sugar maple glaze! Your family will love waking up to these! While everyone was still dreaming of all things corn, zucchini and margaritas, my heart was pitter-pattering for all things pumpkin and hot cocoa. 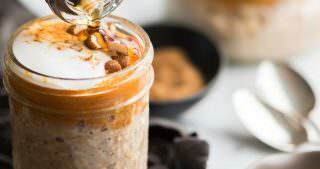 You see, in order to bring delicious, fall-inspired treats and dishes for you all, I have to start brainstorming and testing recipes a couple months in advance. Our kitchen is all sorts of confused. But when it came time to whip these babies up, there was no complaining in our neck of the woods. 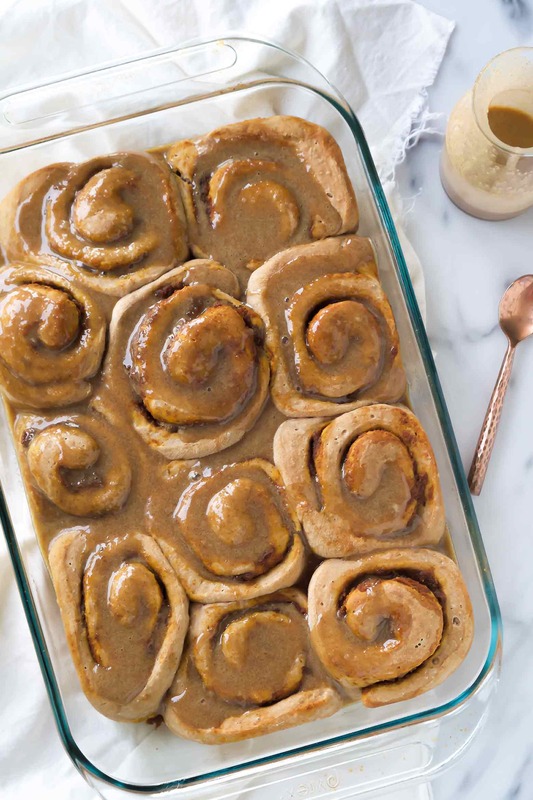 These cinnamon rolls pay homage to every Thanksgiving Day memory. For as long as I can remember, we head to my Nana’s house for a Thanksgiving Day brunch after a run called The Gobble Wobble…you know. 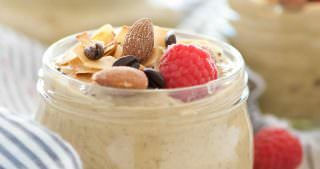 With the intention of burning off some of that hefty meal that follows later in the day. We just really throw in the towel and start the day with my Aunt’s famous cinnamon rolls! No ordinary cinnamon rolls though. Drenched in a gooey glaze. And made with a cake mix! A shortcut! 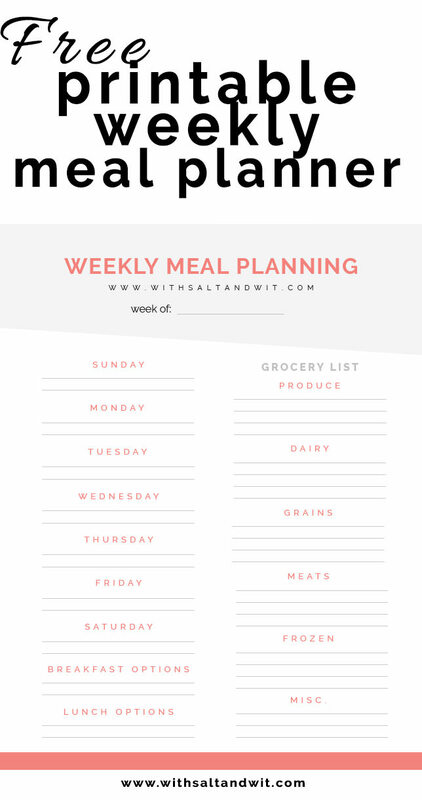 A shortcut that will make your life so much easier and you will be thanking me when the holidays roll around and a homemade treat is essential but not slaving in the kitchen a minute longer is necessary. 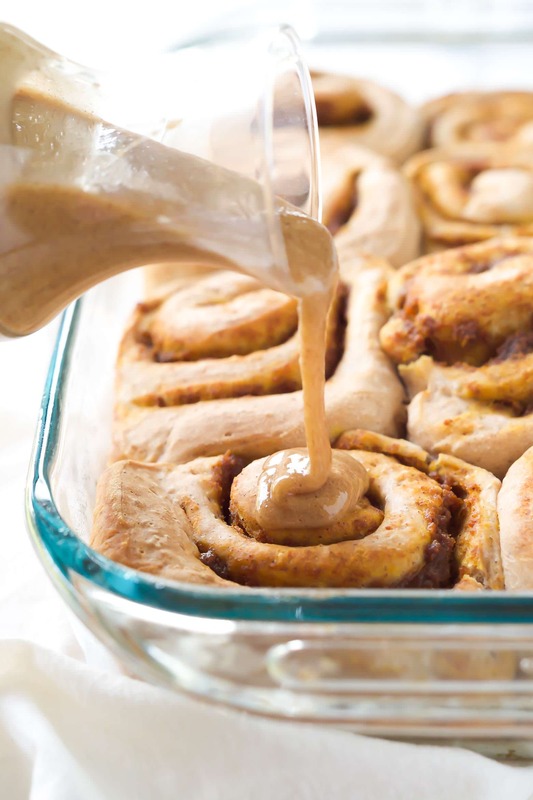 I love these pumpkin cake mix cinnamon rolls for so many reasons. The cake mix takes the place of all the leavening agents, sugar, and such. Think of cake mix cookies. It makes these rolls nearly fool proof. Perfect for someone who is just finally finding their way in the baking world! For today’s rolls, I start with a pumpkin cake mix (obviously), but feel free to use regular or another flavor to celebrate something special. Say funfetti for a birthday? Oh yes. 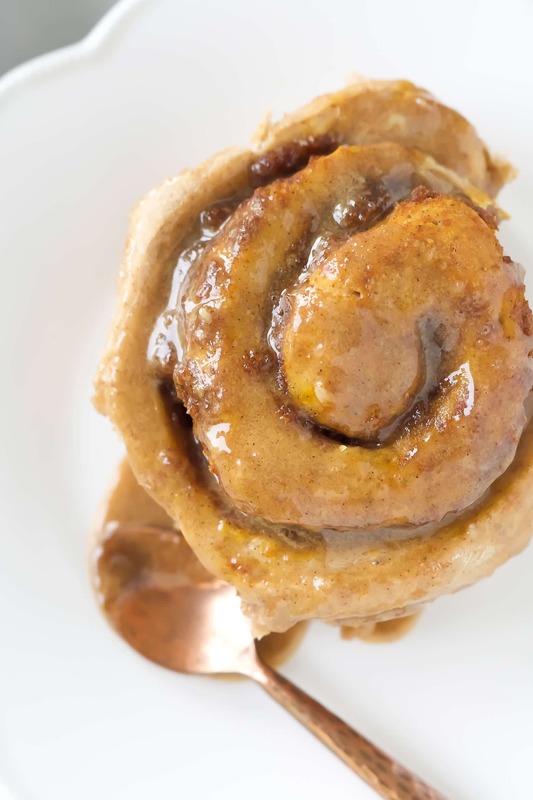 Another reason the pumpkin or yellow cake mix cinnamon rolls are a favorite? You can make them the evening before and let them rise overnight in the fridge. Simply make the rolls through slicing and placing on a pan. Then you can cover and place in the fridge overnight. When you are ready to bake, take out a couple of hours before hand and place in a cold oven. No needing to preheat. Another perk! And the last component that I love? Oh that glaze. Bowl. Spoon. Mouth. 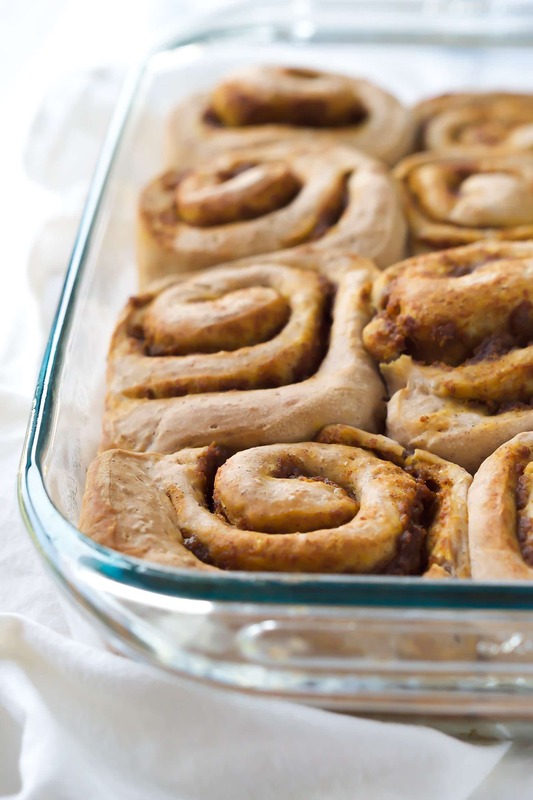 It is incredibly delicious and takes these Pumpkin Cake Mix Cinnamon Rolls from good to fan-freakin-tastic! 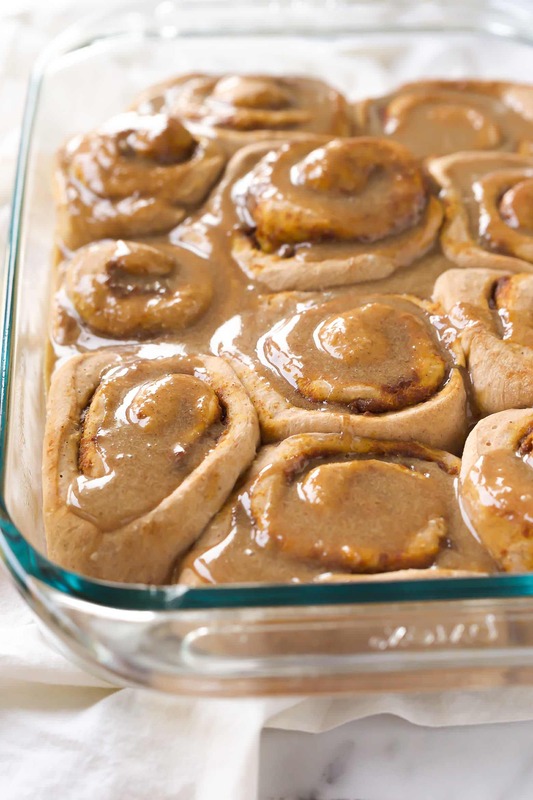 You will forget all about pillsbury cinnamon rolls. I suggest doubling it so you have this ooey, gooey glaze to pour onto just about everything this fall. Now how is that for starting fall off right? You can make them the evening before and let them rise overnight in the fridge. Simply make the rolls through slicing and placing on a pan. Then you can cover and place in the fridge overnight. When you are ready to bake, take out a couple of hours before hand and place in a cold oven. No needing to preheat. Prepare the filling and icing. Store in sealed containers in the fridge until ready to use. Dough: In a stand mixer, add the cake mix, flour, yeast and pumpkin pie spice. Add the warm water and mix until dough comes to a ball. Put dough into an oiled bowl. Spray top of dough and cover with a towel or plastic wrap. Let rise until doubled, about 1 hour. Punch dough down and knead out all the air bubbles. Flour a work surface and roll dough to an 18x20” rectangle. Filling: Mix together the ingredients for the filling: pumpkin puree, brown sugar, cinnamon and pumpkin pie spice. Roll up dough starting at 18” side. Spray jelly roll pan with non-stick spray. Slice rolls into 3/4” and place on prepared pan. Should make 24 rolls. If baking that day, let rise for 45 minutes. Put in cold oven and turn to 350 degrees. Bake for 30-35 minutes, or until tops start to turn golden brown. If baking the next day, cover with plastic wrap, put them in the fridge and take out a couple of hours before baking. Put them in a cold oven and turn to 350 degrees F. Bake for 30-33 minutes, or until tops start to turn golden brown. Icing: Meanwhile, in a small bowl, whisk together the ingredients for the icing. Set aside until ready to eat. Drizzle with frosting before serving. *If you cannot find pumpkin cake mix, spice cake mix works too! 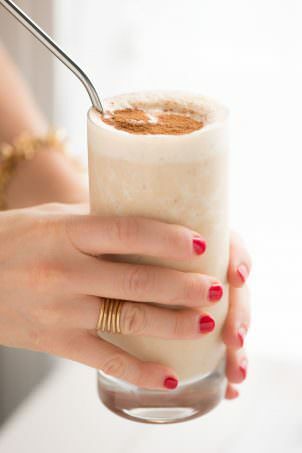 Just add another tablespoon or 2 of pumpkin pie spice! 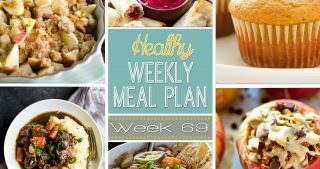 *For meal prep and overnight tips, see above in blog post. 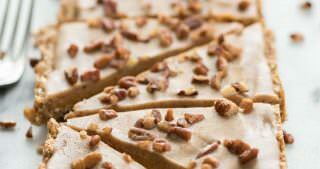 « No Bake Salted Caramel Pumpkin Bars + Video! I hope you do! They were gone in no time here ;) Thanks Aimee! 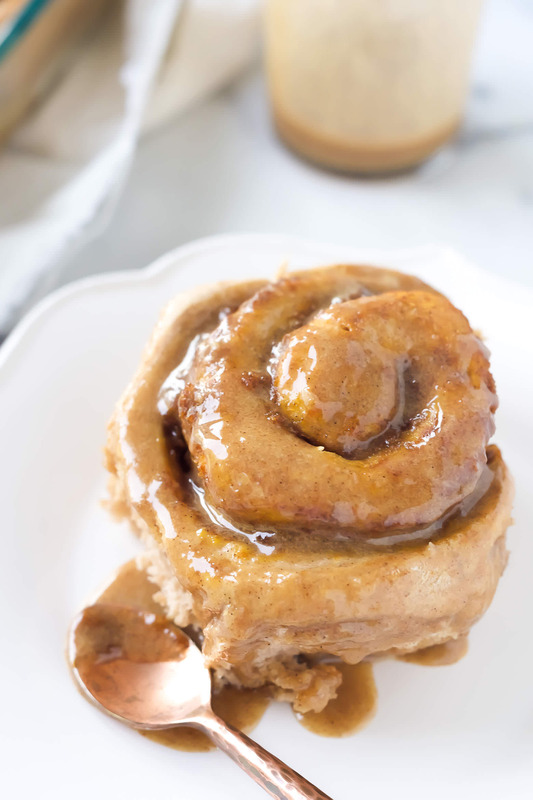 Totally in love with these cinnamon rolls....and I love how easy they are! Awe thanks! 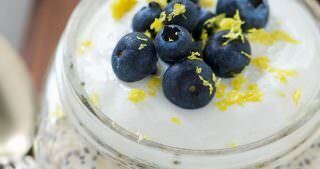 Sometimes we just need an easy button for these little indulgences! Thanks Kellie! These are goooorgeous and they look SO good! 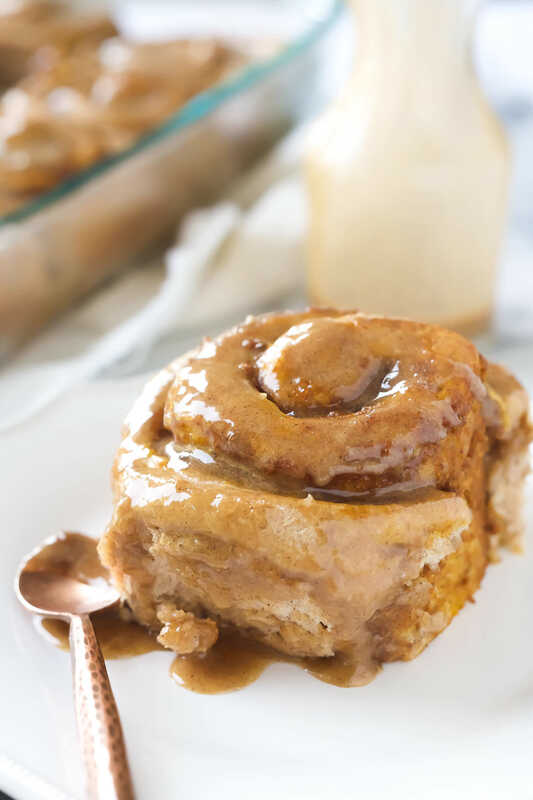 I love Fall and everything pumpkin so these cinnamon rolls are definitely on my Fall baking list, for sure!! Why thank you Jessica! I couldn't agree more...fall is great! Thanks Jessica...hope you enjoy them! What an awesome looking batch of cinnamon rolls! Love that it's made easier by using pumpkin cake mix....yum! Why thank you! And cake mix for the win! The gobble wobble..haha! I love it! I'm such a sucker for cinnamon rolls and my mouth is seriously watering looking at these! Love this fall treat Meg! It is so much fun! And I second that. They get me every time! Thanks Danae!! These look incredible! So light and fluffy and that glaze is amazing! Thanks so much Annie! Oh that glaze...just pass me a spoon! I love fall baking and how it fills the house with wonderful aromas!! I can't wait to try these out and love how you made them easier!! I hope you do..they are always a hit around our house! Thanks Malinda! 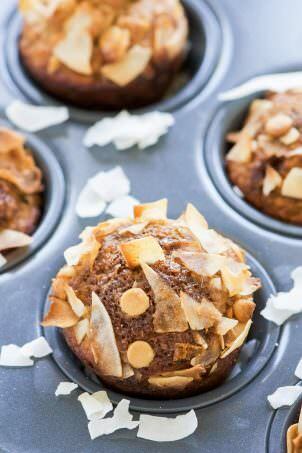 Umm, these totally look like Thanksgiving dreams! These look like a thing of glory, and I am all about the cake mix shortcut (cake mix is so good!). Delish! Using a cake mix is totally genius, can't wait to make these for the kids! Why thank you Sara! Hope your littles love em too! I can't believe these are made with cake mix!! They look amazingggg! Thanks girl! Definitely a time saver! I am so ready for all things pumpkin!!! These look so good, and I love that they use a cake mix!!! Glad you are too! Thanks Jocelyn! I am right there with ya! And oh yes. The smell is intense! Forget the zucchini. I want THESE! They look amazing, Meg! I am right there with ya!! Thanks Andi! How have I never heard of cinnamon rolls made using cake mix?! That is a game changer!! Send some rolls plus that cute copper spoon of yours! Right?! Definitely going to be making more cinnamon rolls in my life now! Thanks girl! These look amazing! Question - the recipe says it yields 24 rolls but the picture doesn't show that many. Did you have to use two pans? Just wondering so I don't make way too many. Thanks!! Can't wait try them. Hi Natalie, thanks! And yes. 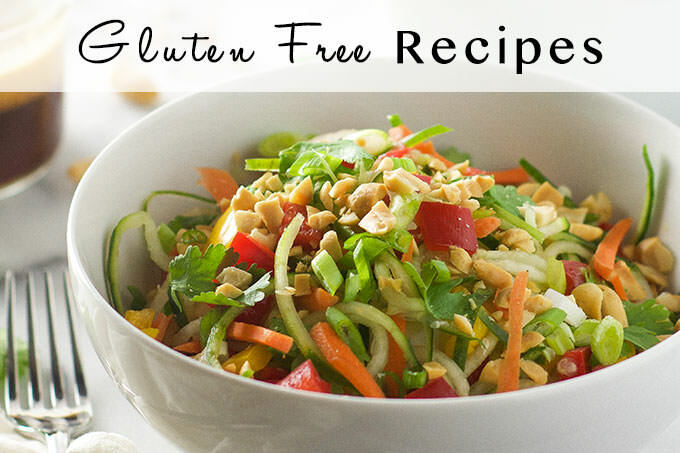 This recipe makes 24. 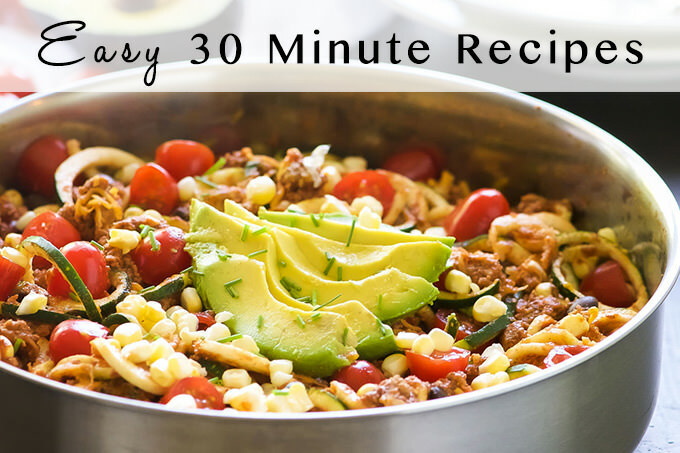 But with how many times I have made this recipe, I only made half of it. Enjoy! What brand of cake mix did you use? Yum!!! Can't wait to try! If I make the dough and put it in the refrigerator overnight will it still turn out the same? Yes it will! Within the post, I talk about how to make them the night before. Enjoy! WOW!! These Cinnamon Rolls are absolutely amaaazing!! I can't wait to try them!! What?! 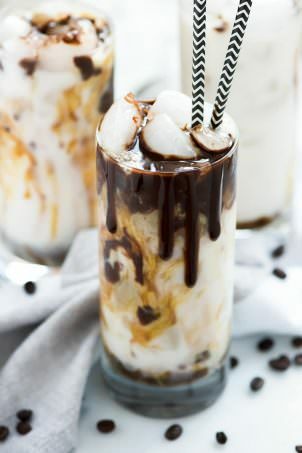 These look crazy delicious, girl! Oh I want to join your Turkey day morning! Thanks Patricia! My kids would absolutely love these -- perfect for Thanksgiving! I bet! We all love them around here ;) Thanks Dee! These are quite the fall treat Meg! Loving that glaze! The glaze is totally addicting! Thanks Trish! I love every part of these! I really love the topping! 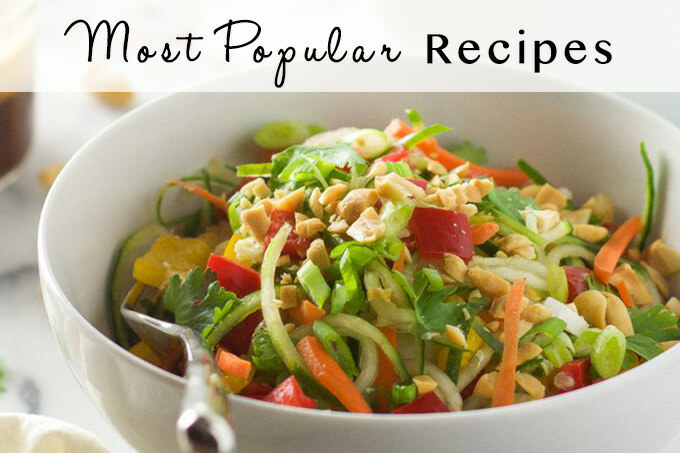 The topping is always the a little added bonus, right?! Thanks friend! What a fun idea! 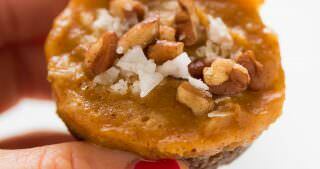 These would be awesome for brunch on Thanksgiving weekend. Thanks so much! We love them on Thanksgiving morning! I made these for a potluck breakfast at work andm while in the end they turned out ok and were delicious, I had a heck of a time! I loved the fact that I could just put everything in my stand mixer and let it go, and the dough rose beautifully. After I rolled it out and filled it though, I rolled it up and the dough was so soft that the roll basically flattened out! It made it very difficult to cut into slices - I only ended up getting about 16, and I had to very carefully pick them up with a long spatula and then reshape them in the pan. I chilled them overnight, and in the morning when the dough was cold I was able to reshape them. I also ended up transferring them to two 11x7 pyrex dishes and they turned out fine. But do you have any tips for when I make them again? If I chilled the roll before slicing it would it work better? Did I not mix the ingredients well enough? Thanks! Hi Kelly, glad they were delicious! So sorry to hear about the difficulty. I would suggest adding more flour to make them more moldable. I hope that helps! Thanks Meg, I'll give that a try! Regardless they were still delicious and worth the effort - I received many compliments on them! That is great! So glad you all enjoyed them ;) They are hard not to! Did you use rapid rise yeast or regular? Hi Rhonda! Just regular. Enjoy! Hi Rose! Check out Steps 10 and 11 of the directions as the baking is slightly different if you are baking day of or next morning. Hope you enjoy! Did you proof the yeast before adding it to the mixture? I have always made them as the recipe states and had no issues. Hope that helps!